By Marija Šestan | Published 25. June 2017. An exciting off road adventure which departs from the city of Split will enable you to familiarize yourself with the architecture of old Dalmatian hinterland villages and the traditional way of life. 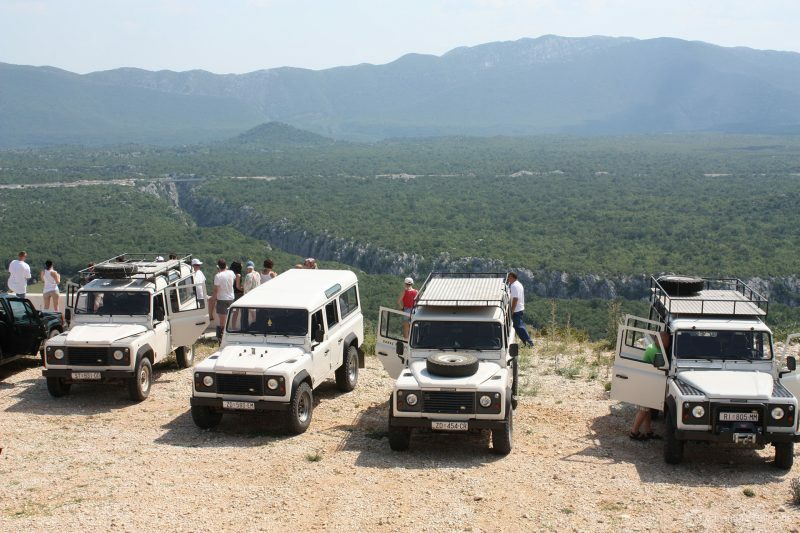 Traveling in off road vehicles allows us to have an unusual experience of an area where the mountains Mosor and Biokovo are only separated by the deep canyon of the Cetina river which flows into the sea at this point. We begin the off road tour driving on the southern slopes of the mountain Mosor and the path leads us to an old abandoned village of Gata. After visiting the village we continue driving to the village Blato on Cetina where we organize a barbecue lunch on the lawn by the river. After lunch we drive to the village Zadvarje where we visit the highest waterfall on the river Cetina (Great Gubavica 55m). On our way back to Split we can take a swimming break or go sightseeing of the city of Omiš. Availability: Every day from 15th of April to the end of October. This article was posted in Adventure, Excursions. Bookmark the permalink. Follow comments with the RSS feed for this post.Both comments and trackbacks are closed.